Google Thewallinna and other creatures: Last giveaway! I am happy to announce the winner of our previous giveaway, Evie! I remind you, that this giveaway is running between my blog and Japanese Sewing Books, whose owner Yi Farn kindly agreed to share it. If you already own a Japanese sewing book, you can find a lot of useful information on her blog, for example, how to understand Japanese patterns or dictionary of Japanese sewing terms. To enter the giveaway, just leave a comment about anything that crosses your mind - the state of international affairs, the book you are currently reading, today's weather forecast or your current sewing project. Yi Farn and I will draw one winner from those who have commented on either blog (maximum two entries per person, for leaving a comment on each blog). The giveaway ends on May 16th, 23:59 Japanese time. I´m the first !Que lástima que es el último, adoraría ganarlo! Thanks for the giveaway! Wowie! The dress on the cover is a-ma-zing. And the both of you are so gracious with all of this giving -away! I really hope I am lucky this time!! Thank you very much for such a wonderful giveaway. I'm looking forward to trying a Japanese pattern! book, you will be mine! I want this one! I will take care of it dearly. I’m trying to collect all the Ryoko Tsukiori’s “Stylish Dress Book” series. I already got the volume 1 (published by Tuttle, the english version), and the volume 2 (also in english) is on the way to my address. It would be perfect to have this 3rd volume written in Japanese. Oooh our last chance... maybe I'll do some shopping when this is over. I really liked the book with all the blouses in it. Last one! Thank you for the giveaways, it was fun to participate. Cute skirts are fun, but cute dresses are nice too~ I hope whoever wins this enjoys making the dresses. Oh I so hope I win this one :) Love Japanese sewing books, thanks so much for the giveaways! 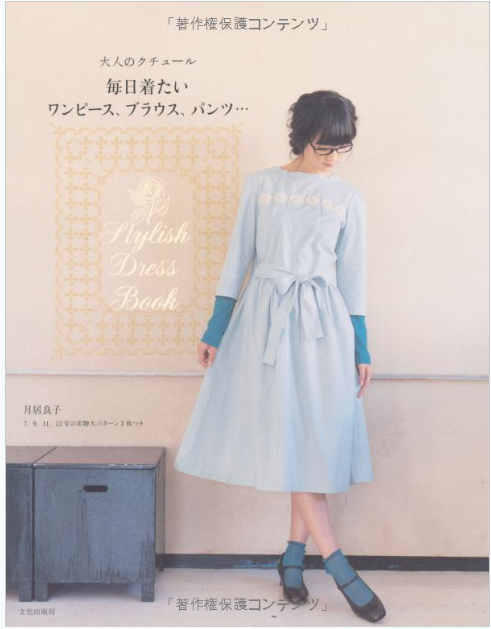 I’ve been eyeing on this book for so long… Stylish Dress Book series is my favorite. I’ll be the luckiest one if I could win this time. Thank you for the great giveaway! I' currently reading the second book of the Century Trilogy by Ken Follet and I'm enjoying it very much as I enjoyed the first book. Thanks for the chance! Congrats on this blog dear I---! How do you have the energies to combine both your challenging job with such an amazing output on the creative side in your free time! When I discovered your blog just recently, it/you inspired me a lot! It's a dream come true to learn sewing and fashion design in Tokyo. ( I bought the pattern magic Japanese sewing books when I was still in Dublin and would love some new inspiration :) . ) Good luck and continue to have fun! Anna G.
Hahaha :) Hi! Who would have thought that this blog will be discovered :) Where is your blog? Where are your creations? I brought back a large pack of fabric from our trip to Japan. This would be something for it!